President Donald Trump has confidence in U.S. intelligence agencies, just not certain leadership layers and the many former top intel officials who have turned their criticism of the 45th president into lucrative book deals and television gigs. 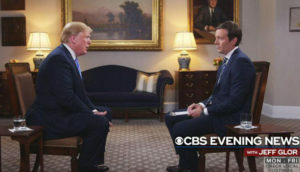 “It’s been terrible,” Trump told CBS anchor Jeff Glor on July 18, citing the names of former CIA director John Brennan, former director of National Intelligence James Clapper, former Director of the National Security Agency Michael Hayden, former FBI Director James Comey, as well as FBI agents Andrew McCabe, Lisa Page and Peter Strzok. Asked whether or not he felt that former intelligence agents were “out to get him,” Trump said that he had difficulty trusting their judgment, as they stood vehemently against him. The president chose his words carefully with a secret realm in Washington that few other than himself have dared to challenge publicly. “Certainly I can’t have any confidence in the past,” Trump said, citing “all of the shenanigans that have gone on” in the intelligence community under former President Barack Obama. “Very hard to have confidence in that group,” he added. Trump said that even though Clapper wrote him a “beautiful” letter when he first got into the presidency, he turned against him. “All of a sudden, he’s gone haywire because they got to him and they probably, got him to say things that maybe he doesn’t even mean,” the president said. Trump said that he was confident in the present intelligence led by his own appointees such as Director of National Intelligence Dan Coats. “I can have a lot of confidence in the present and the future, because it’s getting to be now where we’re putting our people in,” he said.